People often think green design has to be boring. I always laugh when I hear that—some of the most unique, modern and cutting-edge materials are made of recycled glass, seed shells or recycled soda cans. People often think green design has to be boring. I always laugh when I hear that—some of the most unique, modern and cutting-edge materials are made of recycled glass, seed shells or recycled soda cans. The future of design lies in resource-efficient, sustainably harvested and healthy materials. Here are a few of my favorites, which show you that “green” will not make your home look like a mud hut. Architects are always looking for innovative materials. After all, aren’t you bored with granite countertops in a kitchen? I think a material has potential if my students go crazy when I show it to them. Alkemi is one of these products. I guarantee you have never seen anything like it. 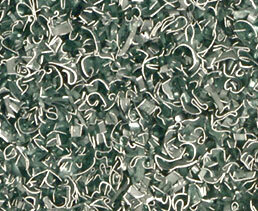 Curled shavings of scrap aluminum are embedded in a resin that comes in dozens of colors. The metal reflects light wonderfully, and the resin provides a space-age appearance. With both a cast side and a polished side, Alkemi also gives you an easy way to use the same material in different ways. Most clients' eyes glaze over when the subject of choosing a tile comes up. For this reason, we typically look for materials they have never seen before. The sleek, 100-percent recycled aluminum tiles from Eleek always get clients excited again. The price is high at $95 a square foot, but the tiles are best used as accents in small amounts. The glint of the metal reflects surrounding colors, and the smooth surface is a great contrast to stone or ceramic tiles around it. For a wide palette of design options in a bathroom or kitchen, Fireclay tiles are a great choice. The gorgeous colors, crackled surface and odd shapes (some are 6 inches by 3 feet!) create a surface with the durability of tile but a unique appearance. Fireclay Tile makes ropes, moldings and relief tiles, but my favorite is the Claymonde series of wall tiles. Arrange them in a modern, random pattern to create a Mondrian-like painting in a shower. However, Fireclay’s Debris Series tiles, which contain 50 percent recycled material, are the company’s only distinctly green product. Set in a field of tiny, colored mosaic squares, Oceanside Glasstile offers unlimited design freedom. Since we often have curved surfaces in our work, the small tiles are easy to install and bring out the forms. We often custom blend the colors to highlight the color of other materials and make a featured color pop. Although the tiles are made from recycled glass, they install exactly like any other tile, and the people at Oceanside have always been friendly and helpful. Imagine crushed glass glinting an array of colors set into a durable and attractive smooth surface. EnviroGLAS (and a competing product from IceStone) is a terrazzo, but it is made of beautiful bits of recycled glass rather than stone. I can hand pick the colors, make it into any shape and easily cut openings for sinks. Whenever we show this to a client, they want it in their kitchen. I don’t even mention that it’s a green material until later in the process.